Do you ever wonder of someone is using your username on another social network that you never used ? There are a lot of social networks out there, so if you are willing to check that manually, it will take a while. 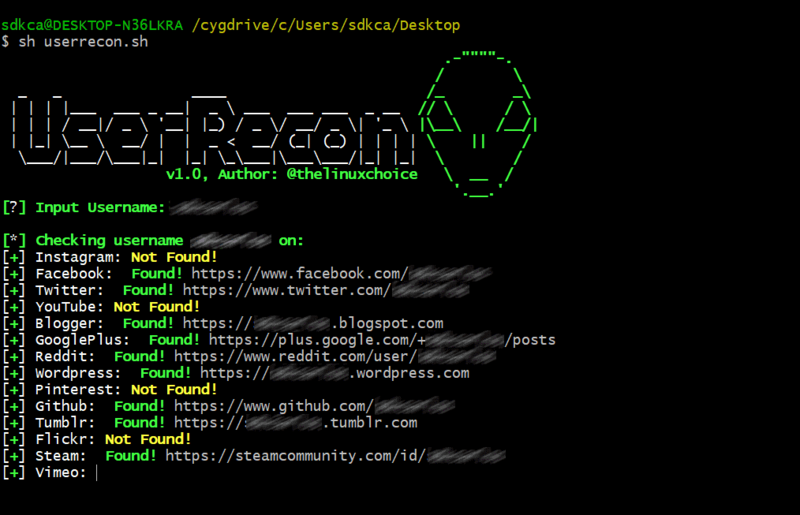 UserRecon is a script that will speed up the process and will lookup for you over 75 social networks. In this article, we'll explain you how to download and use UserRecon on Kali Linux or in Cygwin for Windows. For more information about this shell script, please visit the official repository at Github here. After executing the script, you will get the welcome page of UserRecon and it will prompt for the username that you want to check around the web. This shell scripts works on all Linux distributions and even in Windows (if you use Cygwin) as it's totally written in bash.